Antmee: I made a doll! Oh, my, she is just too cute!!! You did such a great job...and on your first try! I love to make dolls...just finished a baby doll for a shower gift...aren't they so much fun to make? Oh she sure is a cutie pie!! Just excellent. Love her facial expression and just great hair. She is so cute. I remember my first doll I made. I gave her to my mom, now she is back with me. Kylie, I am not at all a doll person, but I have to say she is one of the cutest dolls I have ever seen...I just love her face!! You did an absolutely EXCELLENT job! You definitely need to make more! What an adorable doll. You did a good job on the eyes! Very anime eyes. I can't believe you could part with the doll. Nice dress too. I'm really into dolls clothing myself. She is just lovely and what a pretty face. 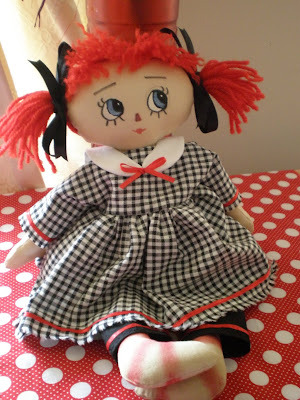 That is the cutest little doll ever, i want one, which means im now going to have to make one. Oh man!! does anyone want to make one for me? she is so cute , lovely. 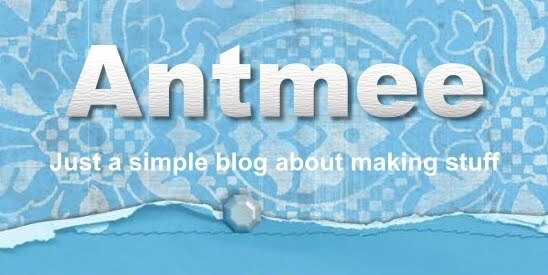 Antmee..your recent creations are so lovely! Wow--you are quite the seamstress! I love what you've done here! Your doll is just cute and beautiful! You did a great job and for a first doll I am quite impressed. Wow! I made my first dolls months ago and I still haven't made any clothes for them! You are way ahead of me. how super cute is she! She is GREAT, super cute!!! You did a wonderful job, she's very sweet! You inspire me! I love this doll. Once I made one myself. A Raggedy Anne styled doll but it looked more like an angel. Thanks for posting the pattern. I'll have to try it out. BTW - Just found you today and I'm following you. I will be 42 this Easter Sunday and I just discovered doll making! I have looked for months and months (since last November) for a doll pattern that I was happy with. I just found LillieMaes site yesterday. I dashed to the library to print a few (out of ink) and just made the teddy bear! I LOVE YOUR DOLL! Lookin to correspond with you in some way as I might need some help and none of my friends are into the doll thing! I have been sewing for 6 years and am retired from nursing. Please find me on my blog and send me a message! What doll are you making now? I'd love to know! 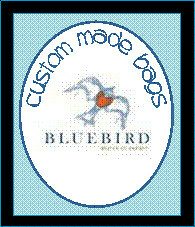 www.cocobeanzcreations.blogspot.com Please follow me as I am following you! Nice blog!! !